At the end of 60 minutes of play on Monday night in Nashville, the Islanders were blanked 5-0 giving Anders Lindback his second straight shutout. The Predators special teams unit deserved the win as they scored two of five goals on the power play while the Islanders failed on all three power play attempts, just one game after they ended their power play scoring drought. Through 60 minutes, the turnovers Capuano was referring to added up to the Islanders nine giveaways to the Predators five, while the Predators tacked on an additional 14 takeaways, compared to the Islanders 11. 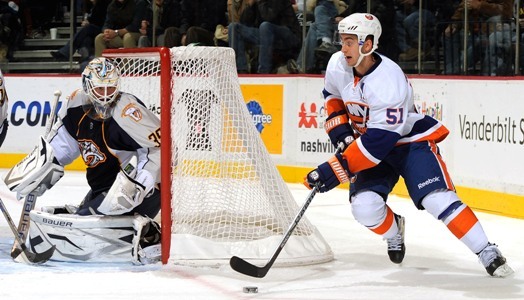 The one positive was that Islanders forward Rhett Rakhshani made his NHL debut at Bridgestone Arena in Nashville. He recorded one takeaway with 11:44 of ice time and finished the game with an even plus-minus ranking. For his first game at the National level, Capuano thought Rakhshani played well. Even though Rakhshani played well, penalties were a problem on the Islanders bench. With less than three minutes left in regulation, the Islanders took two high sticking penalties just 34 seconds apart. While playing 5-on-3 hockey, Nick Spaling scored his first career NHL goal at 18:15 to give the Predators a 5-0 lead over the Islanders. But it wasn’t the fifth goal that gave the Predators the win. It was a power play goal scored by Predators defenseman Sergei Kostitsyn at 11:15 of the first period after PA Parenteau went to the penalty box for tripping at 9:37 and the Islanders were just 22 seconds shy of killing the first penalty of the game. Patric Hornqvist made the score 4-0 Predators when he scored his second goal of the night at 13:55 of the final period. And by the end of the second period, the Predators were leading 3-0 after Hornqvist (5:22) and Jerred Smithson (7:31) scored. Even as the Islanders trailed 3-0 in the second, they kept it close in the shots on goal department. Both teams had 11 shots, giving the Predators a one shot (19-18) lead. And to this point, the game was characterized by back-and-forth play as each team skated up-and-down the ice connecting passes, fumbling pucks and generating turnovers. But the Islanders won 61 percent of all faceoffs taken and recorded 15 hits to the Predators nine. While Predators had 11 takeaways, the Islanders had 10. The only statistic which is denoted a negative impact were the amount of giveaways the Islanders were making and even that was just different by a small margin (Islanders 7, Predators 4). While the Islanders outshot the Predators 28 to 26, that wasn’t enough for to earn a win.